Valve Spring Dia. Outside 1.55 in. Valve Spring Dia. Outside 1.375 in. Made of highest quality spring wire and precision wound to close tolerances, our Sure Seat Valve Springs are designed for use on original equipment heads with our Performer-Plus, Performer RPM and Torker-Plus camshafts. The #5900 Series valve springs are designed for use with OEM valve rotators. To keep your warranty valid, use only the springs recommended by Edelbrock for each camshaft application. 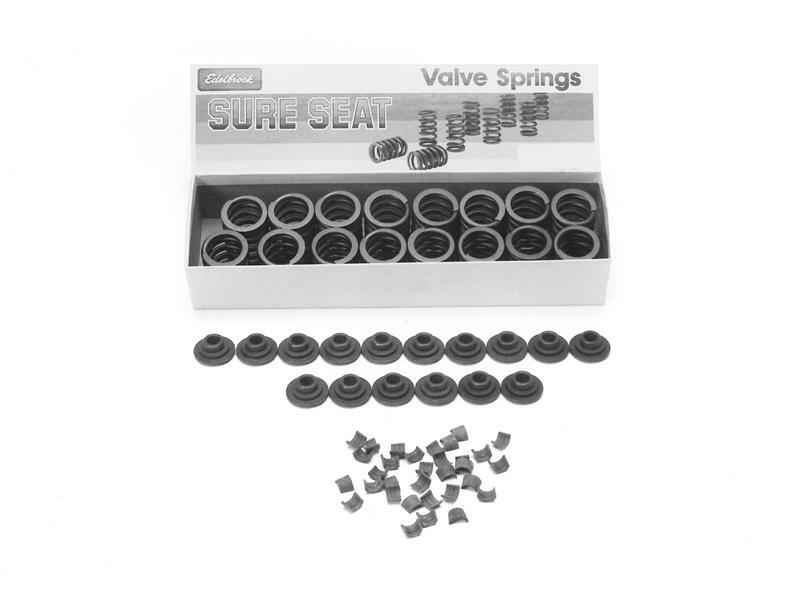 Valve Spring Kits contain non-rotator valve springs, retainers and matching valve stem locks. Made of superior quality steel, machined and heat-treated for strength, these retainers have a black-oxide finish for rust and corrosion protection. Sold in sets of 16. See Application Guide below for complete listing. Heat-treated machined (HTM) 7° valve stem locks for use with Edelbrock retainers. Black oxide, top-quality steel for maximum strength. Available in sets of 32 (except #9614).